I know, I know, it's not Wednesday yet. This is probably going to confuse me and tomorrow I'll think it's Thursday and get all excited that the weekend is only a few days away. But I figured it might be best to put off posting about Downton Abbey for another day so as not to overload the blog. This collection of pieces is pretty much at the top of my Spring Wish List. Mint, yellow, and white are the colors I'm most looking forward to this season and I've had my eye on this sweet Maya Brenner bracelet for some time now. And oh my goodness, I am so obsessed with these sparkly Miu Miu sunglasses! Sadly, they're a little bit out of my budget right now. 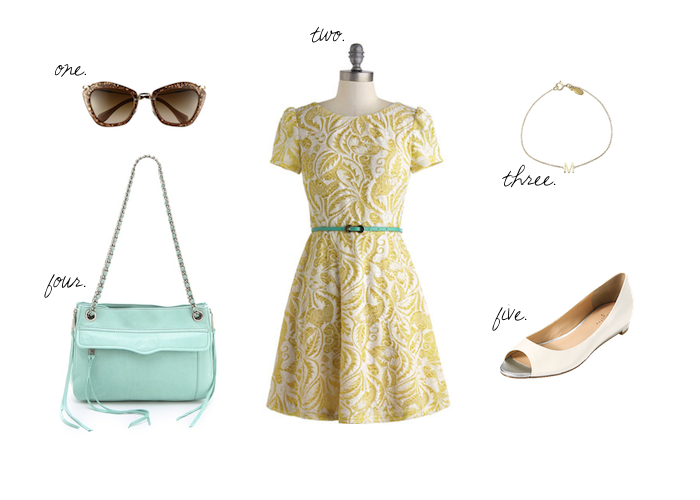 What are you most looking forward to wearing this Spring? PS. Just a friendly reminder, it's still Tuesday! What a cute dress! I am still searching for the perfect sundress for spring/summer, and now I think I might want something in that color, or with at least a bit of that color on it!